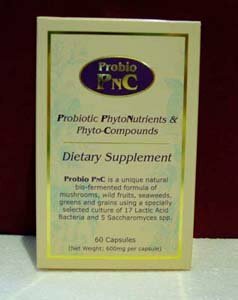 PNC, a probiotic dietary supplement, is a naturally fermented mixture of wild fruits, herbs and seaweeds with a culture of 17 beneficial strains of Lactic acid bacteria. PNC¡¦s unique formula of essential oil and specially fermented substrates keep the lactic acid bacteria non-competitive and alive. Probiotics(literally ¨pro life¨) refer to a group of microbes (bacteria and yeasts) that help rather than harm us. The usefulness of probiotics has in fact been known for thousands of years, in various parts of the world. For e.g. milk products transformed by lactobacilli were more readily digested and had improved keeping quality, taste and nutritional benefits. Laboratory, animal and clinical studies have confirmed and elucidated the therapeutic potential of these friendly microbes. Some of the benefits provided by these beneficial bacteria/yeasts: ƒæ	Production of the B complex vitamins, like folic acid, niacin, B6, B12 and pantothetic acid ƒæ	Alleviation of lactose intolerance ƒæ	Gut disorders: - infectious diarrhoea, antibiotic- related diarrhoea - irritable bowel syndrome - heartburn, bloating - constipation - stomach ulcers - ulcerative colitis ƒæ	Cankers sores ƒæ	Prevention of yeast overgrowth and infections ƒæ	Enhancement of the immune system -	basic products of beneficial microbial fermentation e.g. lactic acid, acetic acid, hydrogen peroxide, acidophilin, lactocidin ¡V produce significant natural antibiotic action. Besides keeping the pathogenic (harmful) bacteria and yeasts in the intestines in check, they also boost immunity via the gut-associated lymphatic system. ƒæ	Improvement in some skin problems e.g. acne, dermatitis ƒæ	Relief of symptoms in various types of chronic inflammatory problems e.g. some arthritic conditions, eczema. Benefits of Microbial Fermentation Each gelatin capsule contains 17 strains of friendly Lactic Acid Bacteria spp. and 5 types of friendly Saccharomyces spp. The 3-year unique natural bio-fermentation process liberates beneficial plant bioflavoniods, phytosterols, beta-glucans, enzymes, amino-acids, vitamins, minerals and other phyto-nutrients. These nutrients not only help maintain and improve the health and function of the cells lining the digestive tract, but also have a pervasive effect on the overall health of our body. The enhancement of our digestive and absorptive processes result in improved assimilation of nutrients from food. Regular consumption of PNC may therefore assist in faster recovery from ailments. Furthermore, the fermentation process results in the availability of many of the phyto-nutrients (plant-derived nutrients) present in the wild fruits, herbs and seaweeds. These nutrients, including various polysaccharides (B-glucans) purported to have immune-boosting, anti-carcinogenic, anti mutagenic effects – are normally “locked” within the plant cellulose fibres. Traditional healers have previously tried to extract these substances via prolonged boiling or steeping in alcohol. However, PNC has the added benefit of these valuable plant and herbal nutrients available in a readily assimilable form, provided by the beneficial microbes. Glyconutrients	Nigero-oligosaccharide, isomalto-oligosaccharide, Essential Honey, perilla oil Fatty Acids Thie 3-4 year natural bio-fermentation process using probiotic lactic acid bacteria and saccharomyces cerevisiae liberates beneficial plant bioflavonoids, carotenoids, phystosterols, beta-glucans, amino-acids, vitamins, minerals, enzymes and other phyto-nutrients. Directions for Use: Probio PNC can be taken as and when required, as a supplementary food for general health and well being. Best taken at least half hour before meals. Store in a cool dry place. Adult: 2-6 capsules daily. Child: 5-12 years of age, may take half of adult dose. This product is not intended to diagnose, treat, .cure, or prevent any disease. This was written for general information purpose only. Let your healing journey begins with Regenerate Wellness.